World Cancer Day takes place every year on February 4, as a platform for raising awareness of cancer and encouraging its prevention, detection, and treatment. In recognition of #WorldCancerDay, McGill University’s Ingram School of Nursing (ISoN) and Hope & Cope are proud to launch The Legacy Project, a documentary capturing the experiences of young adults living with advanced cancer. The documentary features intimate interviews with several adults discussing their experience with cancer care, their interactions with the health-care system, and sources of support. Participants share their thoughts and emotions as they search for meaning and closure while coping with advanced cancer. Carmen G. Loiselle, RN, PhD—Professor at the ISoN and the Gerald Bronfman Department of Oncology at McGill University and ISoN Associate Director of Research—spearheaded The Legacy Project as part of her work as Scientific Director for Hope & Cope. Recognizing the complex needs of young adults as a vulnerable and often isolated population, Hope & Cope has been offering innovative programming for this group since 1986. Throughout her work with Hope & Cope, Loiselle realized that the experiences and needs of young adults with advanced cancer were distinct, and required more than a “one-size-fits-all” approach to their care. For example, a 28 year-old woman with metastatic cancer, whose cancer treatment has rendered her infertile, may feel out of place in a support group with older cancer patients who have had children. Loiselle honed in on the notion of empowerment, and the need for these young adults to have some agency and sense of control over their own care. “The empowerment of young adults during their cancer trajectory presents a unique endeavour, as they face a life threatening illness at a time in their lives where social, psychological, physical and occupational development is key,” says Loiselle. “The goals of The Legacy Project are to showcase the strong voices that young adults living with advanced cancer bring to their situations, and to shed light on psychosocial needs and preferences in the context of their cancer experience.” From a scientific perspective, The Legacy Project is part of a larger study whereby collected data will help researchers and clinicians to learn more about key factors that empower young adults throughout the cancer trajectory. The hope is that the documentary will foster discussions and more empowerment promoting strategies and interventions to best support this group of cancer survivors. 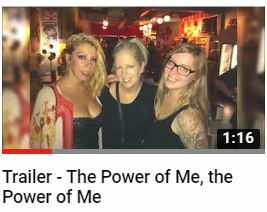 Click here to view an abridged version of the Power of Me, the Power of We.